B.Sc in Paramedical Sciences/ Allied Sciences Courses Admission in West Bengal. 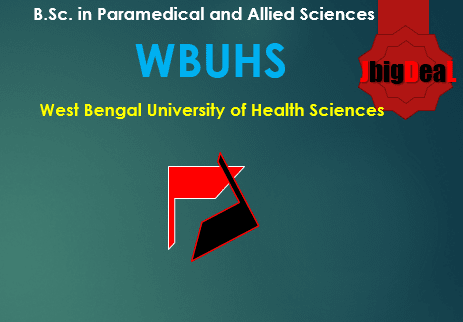 The admission process is administrated by West Bengal University of Health Sciences (WBUHS) for admission to Undergraduate Courses in the following Paramedical Sciences/ Allied Sciences Programmes Academic Session: 2019-20. B.Sc. Para Medical and Allied Health Sciences is a three-year graduate programme. Allied Health Sciences is a newly established concept in health care system constituting to be a separate stream of health professionals. Allied health professionals are an integral part of the medical team along with physicians and nurses contributing their expertise to the preventive, curative and rehabilitative care of the patients. This will enable the candidates to assist confidently in technology-driven medical procedures. With the enormous development in the healthcare industry, these graduates will be much in demand. The course provides a broad-based foundation in global and national healthcare issues and trends, ethical and legal issues, health promotion and disease prevention, evidence-based practice, allied health care research. Admission test for filling up the seats in the “Three years Under Graduate Courses”, from the citizens of India to be conducted by the West Bengal University of Health Sciences (WBUHS) shall be made on the basis of admission test to be conducted and inter-se merit list of different categories/ castes of candidates. Candidates must pass 10+2 Examination with Physics, Chemistry Biology & English with 50% marks in total from recognized board and school imparted practical training through laboratories. For reserved category candidates, cut-off marks are 45% in all three subjects. But the candidate is to pass all three subjects separately mentioned above. Candidates who are already pursuing any other course are not eligible for admission. It is a full-time regular course. However, candidates completing the course or resigning from the course before the date of admission will be eligible to get admission. On-line application forms available with this Information Booklet are needed to be filled up. the separate application for each course. A written test of 100 marks will be held. The question paper of the written test shall be set in English and shall contain 100 single best response type Multiple Choice Questions. The duration of the test will be of 80 minutes. A common aptitude test will be conducted through 100 MCQs. There will be no deduction of marks for an incorrect answer. Counselling & Admission yet to come.